In 2006 the Australian Football League continued to demonstrate its hold on Australia as the dominant football code and winter sport. The year started with the media digesting the news of the record AU$780 million 5-year TV deal. The game also successfully faced the rising challenge of soccer with Australia's surge deep into the soccer World Cup in Germany and unprecedented media coverage. Crowds at AFL matches were virtually the same as in 2005, with home and away matches averaging 35,251 spectators, just 445 per game less than the record set the previous season. Rule changes saw less serious knee injuries to ruckmen and a quickening of the game. There were also promising announcements for funding for footy in South Africa, and a major restructure of the way the AFL approaches international development - more on that in a later article. The Aussie Rules matches culminated in the blockbuster one point win to West Coast in the Grand Final over Sydney. But amongst the successes there have been several issues that will need to be addressed in 2007. The forthcoming season will see several more changes to rules, or to interpretations, such as heavier emphasis on penalising players using their hands in their opponent's back during marking contests, with zero tolerance allowed. With the regular round of rule changes there is a growing body of complaint that there are too many changes. It is true that Aussie Rules evolved to be a better spectator sport than other codes because the rules were continually modified over the last 150 years to improve the game's appeal to crowds. But the unease about the recent number of changes has brought complaint at all levels, from spectators through to AFL coaches, with a call for a moratorium on changes for a year or more. The AFL will need to be aware of this dissatisfaction and move forward with care. Despite the money in the game there remain several clubs that are struggling financially and the AFL has increasingly played a role in their administration. The Kangaroos and Carlton have both made improvements off the field, but are yet to establish themselves free of debt and in no future danger. The Blues appear to be hamstrung by massive political infighting, and some parts of the media don't see coach Denis Pagan lasting the season, if he even gets to round one. There have been various moves to change board positions and accompanying all that have been suggestions that various contenders will bring with them the sorely needed millions to stabilise the once mighty club, which continued to languish at the foot of the ladder. In the case of the Kangaroos (their name of choice ahead of the term North Melbourne), the new year will see them playing some of their matches on the Gold Coast instead of their regular trips to the ACT, as the AFL pushes to capitalise on the sport's massive growth there. 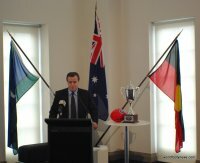 A record number of draftees were drawn from Australia's boom region and with other sports delivering national competition sides to the area, the AFL has said it wants a game in the region every week by 2015 (presumably Brisbane every two weeks and one or more sides making up the other half). Although the Roos hierarchy continue to say no permanent move is on the cards, the AFL have clearly started to use the leverage afforded them by their annual handouts to the club, and some media openly suggest a shift could occur as early as 2008, though no earlier than 2010 seems more likely. Given that some still hold a grudge against the AFL for the way the Fitzroy collapse and merger with Brisbane was handled, this will be a delicate issue for the game's governing body. So too the International Rules series. We've discussed that in detail already on this site, but to summarise, the series has been put on hold by Ireland's GAA due to the perceived violence over the past 2 years, and they will probably give the Australians a list of demands and rule changes if the series is to continue. The modifications may well remove most of the remaining aspects that compromise in Australia's favour, and so whether the AFL submits to such changes will decide whether the hybrid sport has a short term future. Even the television deal has soured somewhat, with Channels Seven and Ten keen to offload some of the weekly matches to another network, but no deal being reached with pay TV station Foxtel. Andrew Demetriou has made it clear that a smaller community broadcaster is not a valid option, and now the federal government's multicultural station SBS is believed to be in the mix. This would be both ironic and very interesting, given SBS has often been referred to as the "Soccer Broadcasting Station" and is believed by many to regularly shun Australia's indigenous game and is a leader in pushing soccer as the only true football, much to the displeasure of Australian Football fans. Another issue for the AFL is poaching of its top executives. The loss of Ben Buckley to soccer is just one of several losses recently, and will need to be addressed as a successor to Demetriou will need to be groomed in the next couple of years. Other questions for the game include allegations of drug use amongst some clubs, the decline of the Brisbane Lions, the game's flagship in Queensland (and the disturbing drop in ratings there), and the need to find ways to improve facilities and capacity in Perth and Adelaide, where long waiting lists for season tickets to West Coast and Crows matches risk turning people away from the game (though we fear solutions are unlikely in the near term). On the field each club will be asked big questions. Can West Coast keep improving - the other sides fear that with their relatively young stars, the answer may be yes. Will the Swans again confound the sceptics to be there in the final week of the season? Can Adelaide squeeze anything more out of their aging stars, after two years running looking likely premiers only to be eliminated in successive close preliminary finals by the Eagles? Will a Victorian club fight their way into the Grand Final for the first time since 2003, or even win the big one (last achieved by Essendon in 2000). The most likely contenders are the young running brigade at the Western Bulldogs, recent regular finalist Melbourne and even the Saints, despite a change of coach and some suggesting their window of opportunity has closed. Outside that group the only other side likely to push for the flag could be Collingwood or more likely WA's other side, Fremantle. Richmond, Hawthorn, Geelong and Port Adelaide will be striving to make the finals, and Brisbane, the Roos, Essendon and Carlton will be fighting to avoid the wooden spoon. All in all an intriguing year on and off the field lies ahead, with the new TV broadcasters, the International Rules future and the build up to the 2008 celebrations (and maybe the return of State of Origin?) for the nominal 150th anniversary of the game all likely to be amongst the most interesting issues.